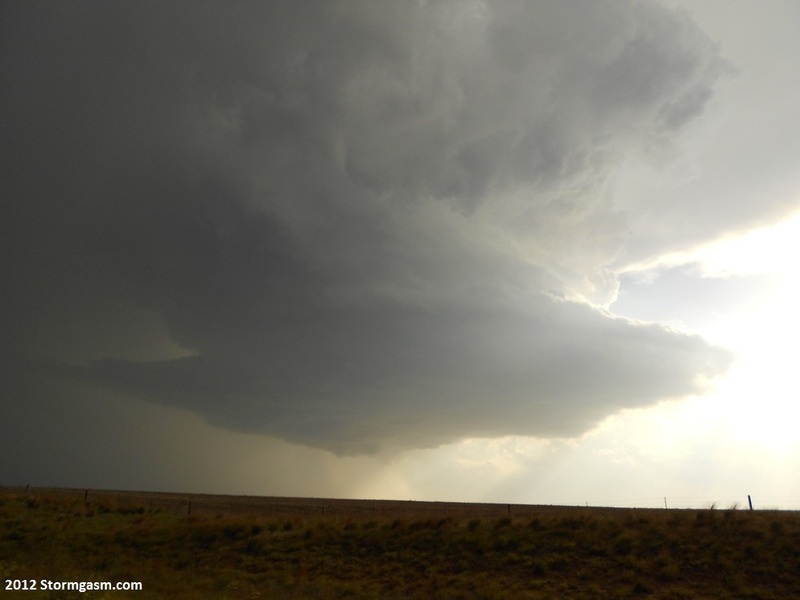 Keeping an active blog and updating it during the storm chasing season while you are out in the field is much harder than you might think. Whether you believe me or not, that’s the excuse I’m going with for the delay from my last post! 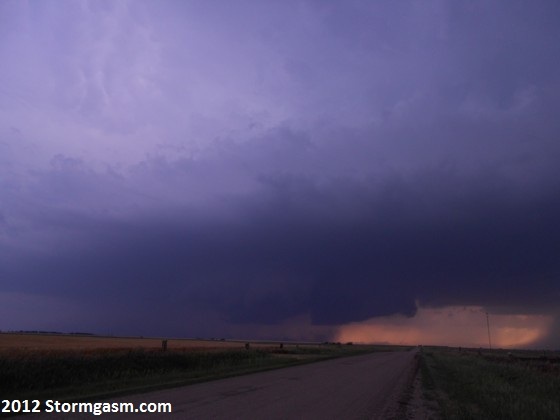 And sadly, the only reason I had the time and energy to write my previous post (for the May 23 Nebraska chase) was because we took a down day. 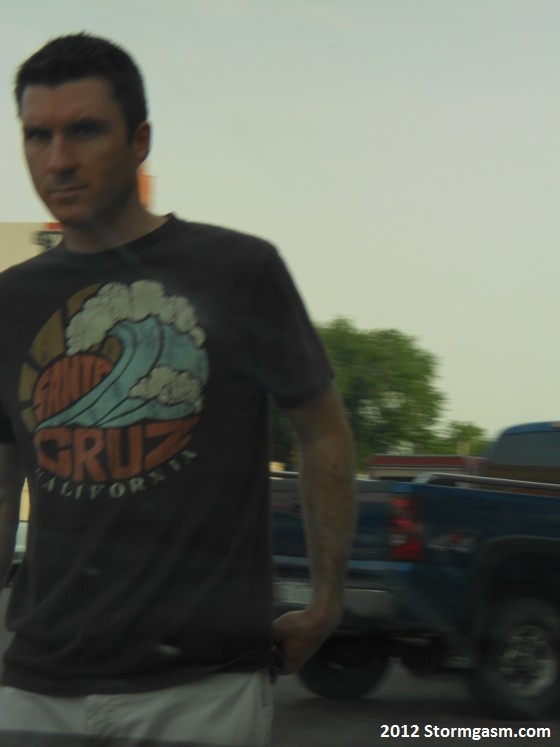 After chasing a cyclic (though non-tornadic) supercell across east-central Nebraska, we stopped in Lincoln for ‘dinner’ that night to look at data (dinner consisted of pounding Walmart sandwiches and assorted grab ‘n go items in the car!). So, on that down day I made a blog post. 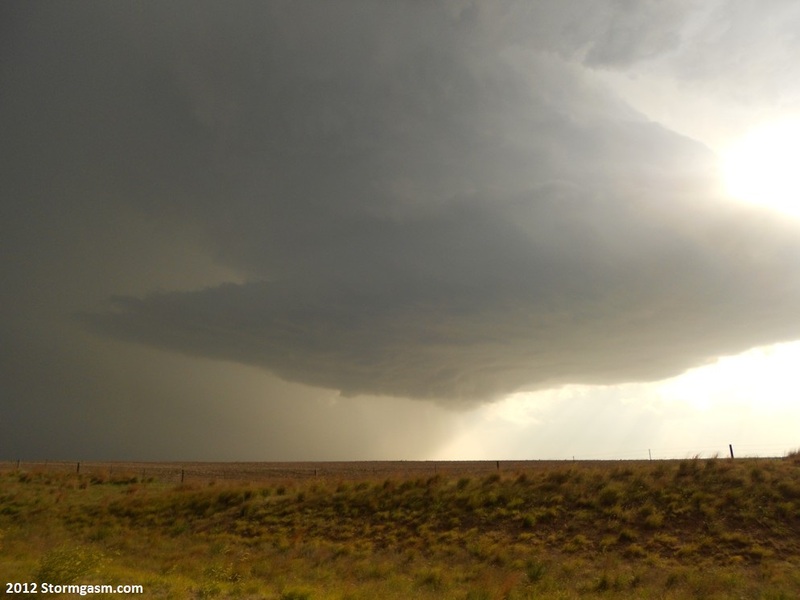 But the remaining days of our short trip to the plains were all chase days, even though most of them were not great setups. Each day consisted of us getting up in the morning pretty exhausted. I’d look at data and refine my chase target for the day. Before long we’d be out of the house (thank you Sheila and Mike for your wonderful hospitality!) and deciding where and what to eat for breakfast. And believe me when I say this is not only an extremely important decision, it’s very risky. On most of the days we took the time to eat at the local grocery store (Dillon’s) which actually has an amazing hot and cold bar with a ton of great, healthy options. The only downside to this is if you have a lot of ground to cover on the road and need to get out of town in a hurry. But, the huge upside is actually having decent food in your stomach to start your day. On the days we decided on breakfast burritos or something from Burger King for a fast, let’s go type of breakfast, we felt sick (not fun when in the car…). Anyways, once the daily challenge of finding breakfast was complete, we’d make sure to have some cold drinks in the car, gas up and then it’s on the road for the rest of the day. Being that most of the storm chase setups looked ok but not great, it was hard to find enthusiasm day in and day out for storm chasing! C’mon, any chaser out there knows exactly what I mean! Now I’m not saying we didn’t have fun and enjoy our trip. But I am saying it seemed like there was a lot more pain than involved vs. fun storm chasing/viewing on this trip than some others in the past. It’s either that or I’m seriously starting to get old! Wall cloud southwest of Russell, KS. After a long drive out to western/northwestern Kansas, we did manage to see a rotating wall cloud southwest of Russell, Kansas. But as was the case with nearly every setup we chased during our trip, the CAP was too strong and caused many problems during daylight hours. This was still a fun day, however. 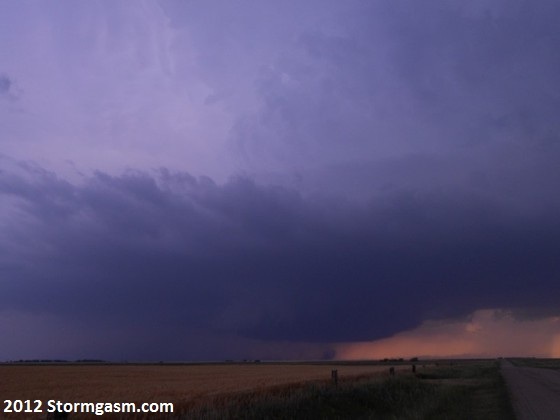 And it’s always interesting when you run into a million and one chasers. From a variety of tour groups to research groups including mobile radar units, to other chasers like us including a Dutch chase team! It reminded me just how many people chase during this time of year from all over the world, some of which had to pay for a seat in one of the many tour vans I came across during the trip. 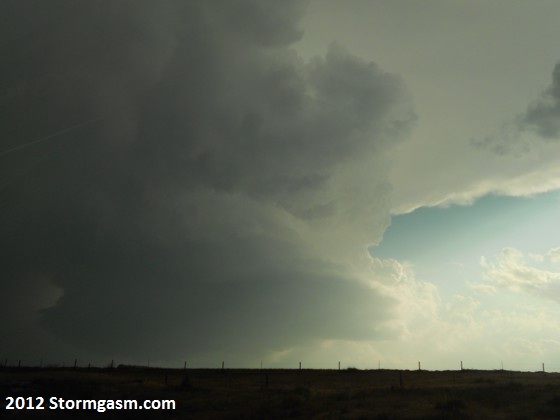 LP Supercell in the distance. 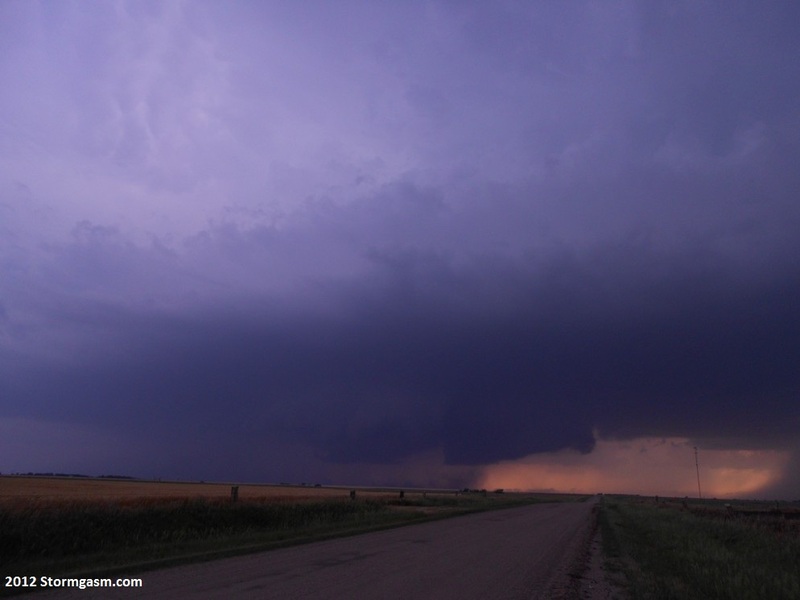 Other days didn’t even result in a rotating wall cloud. 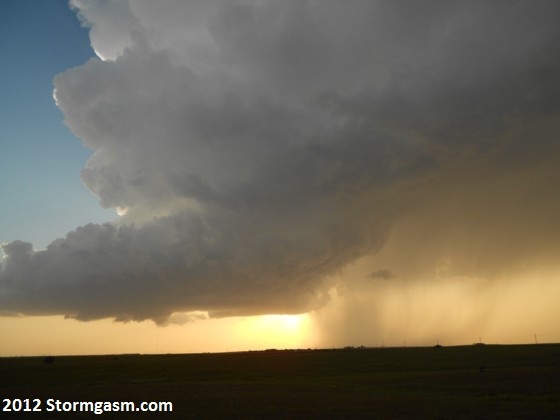 But there is still something to be said for beauty shots of a low precipitation (LP) supercell in the distance. Sometimes you just aren’t going to be very successful because the setup isn’t very good, and you need to appreciate what mother nature delivers. Otherwise, what’s the point of storm chasing? 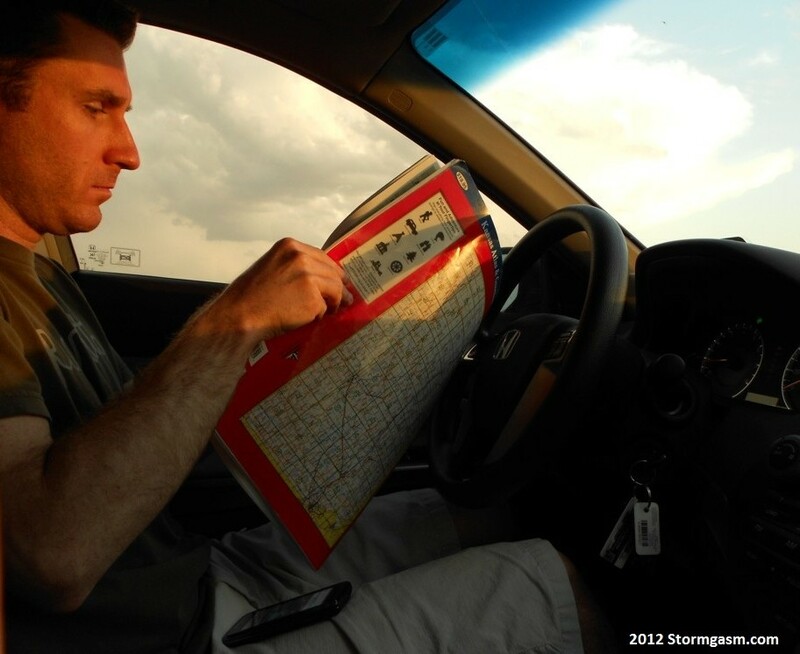 Jim looking at the radar on his phone in Red Cloud, Nebraska during a clear sky bust. Other times, NOTHING forms and all you have is the red sun setting in the distance! I know I just said it’s important to appreciate what mother nature delivers. 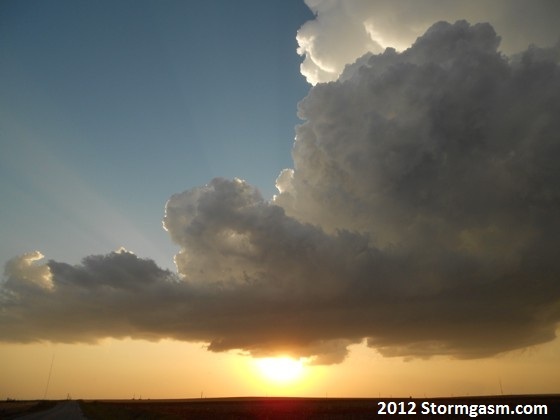 But I can enjoy a sunset anytime…when storms fail to actually develop, that’s rough. 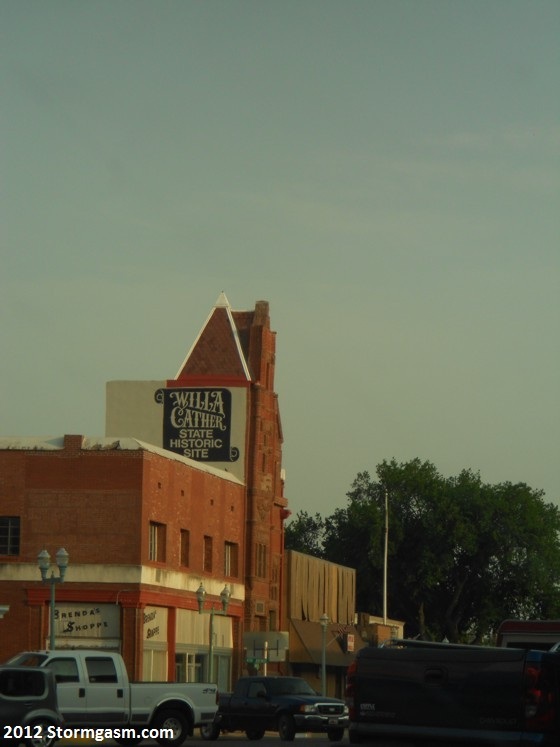 The two images above pretty much tell the story on what we saw in Red Cloud, Nebraska. It was Saturday, May 26, and ironically this day looked pretty good from an eight day lead time! It just goes to show you that things can and a lot of times do change in a big way. In this case it lead to a clear sky bust across most of Nebraska. 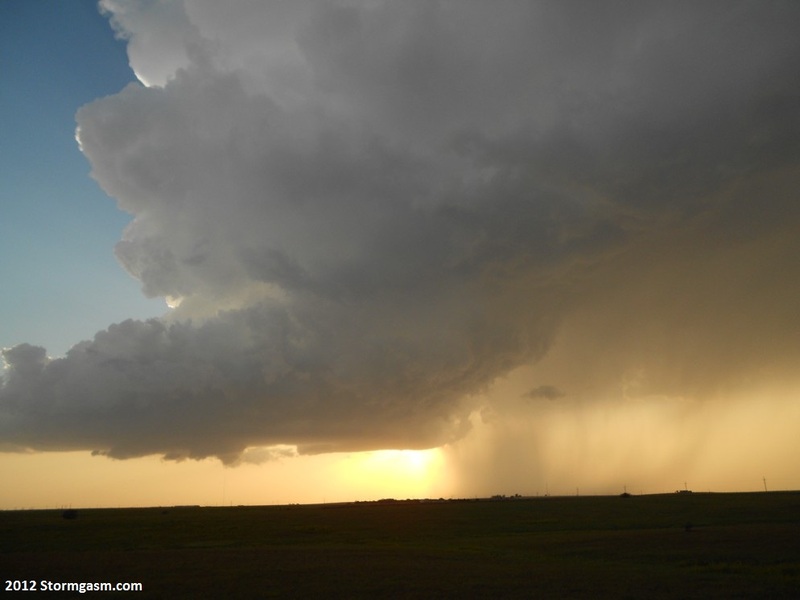 Even the northern targets saw very little on this day, as storms fired across central/northern Nebraska into South Dakota and dissipated as the CAP was simply too overpowering. Days like this are not easy to swallow, but laughing it off helps! 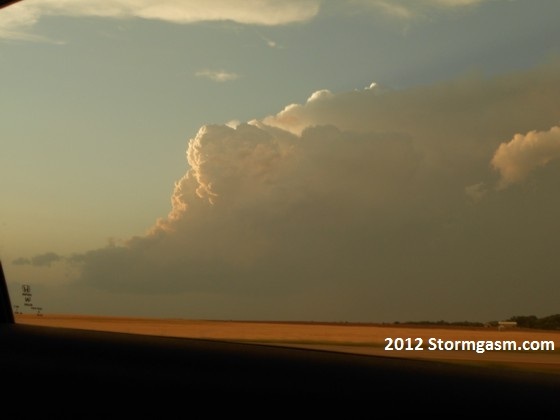 First storm in the area tries to develop north of Hays, KS on May 27. 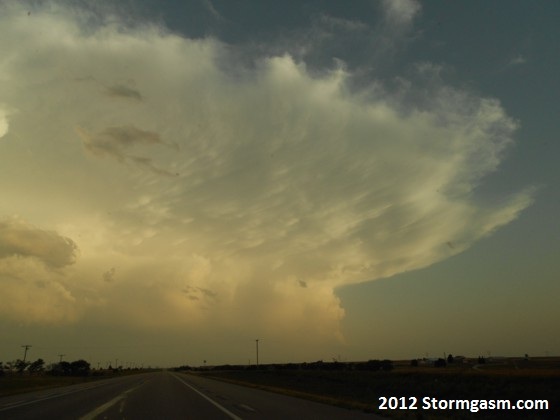 Storms at least formed on May 27. In fact they formed first in central Nebraska along a weak cool front and produced tornadoes, some of which were photogenic. Unfortunately, we were not chasing in Nebraska! I chose the western/northwestern Kansas target for this day. The CAP once again ended up being too strong as storm tops struggled all afternoon/evening to reach 40/45K feet. Admittedly the storms were high based at first due to large dewpoint depressions (surface temperatures were near 100 degress and dewpoints were in the 60s). But that simply wasn’t the main issue. The problem was storms were moving nearly do north right along the dryline. 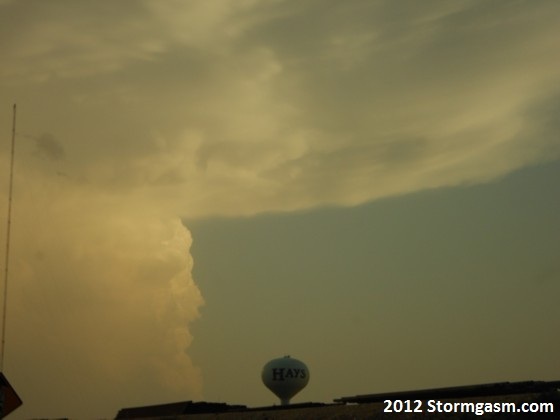 This caused all kinds of problems, making this a no tornado day across Kansas. I’m guessing the supercells that formed in Nebraska were able to interact with the cool front boundary and that’s why they produced the tornadoes early on before everything in Nebraska formed into a messy squall line. 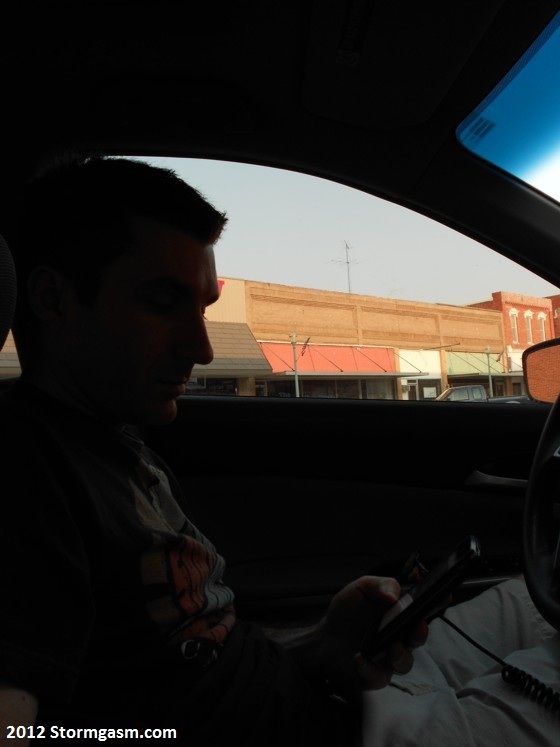 Getting back to our chase, we sat in Hays, Kansas for a few hours waiting for the CAP to break. This was pretty uncomfortable given it was nearly 100 degrees outside. We first waited in a Walmart parking lot where a large research team had parked their vehicles and mobile radar units. 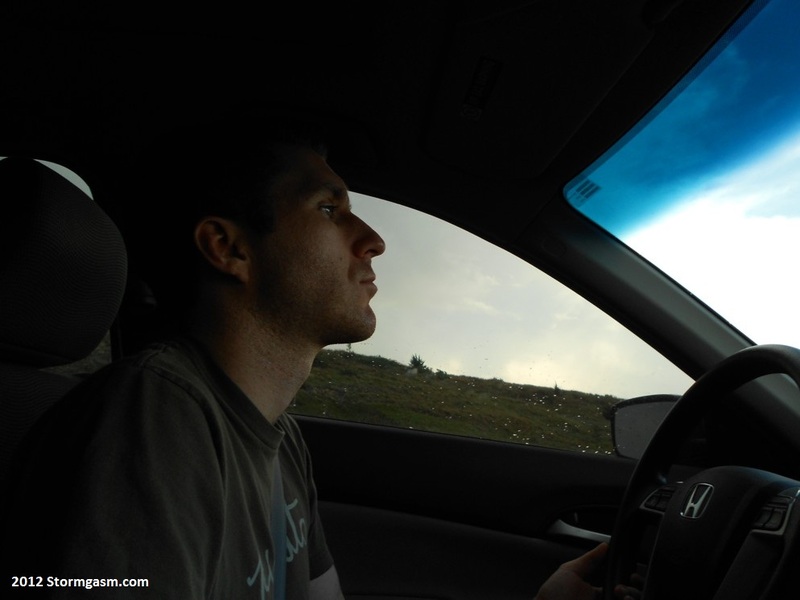 I recognized some of the mobile radars from other chase trips but also saw radars and vehicles that were new to me. At any rate, this parking lot was a major chaser/tornado research convergence. Storms eventually began forming around Hays and we waited until it was clear the CAP was breaking before driving north and sorta keeping up with the increasing towers. 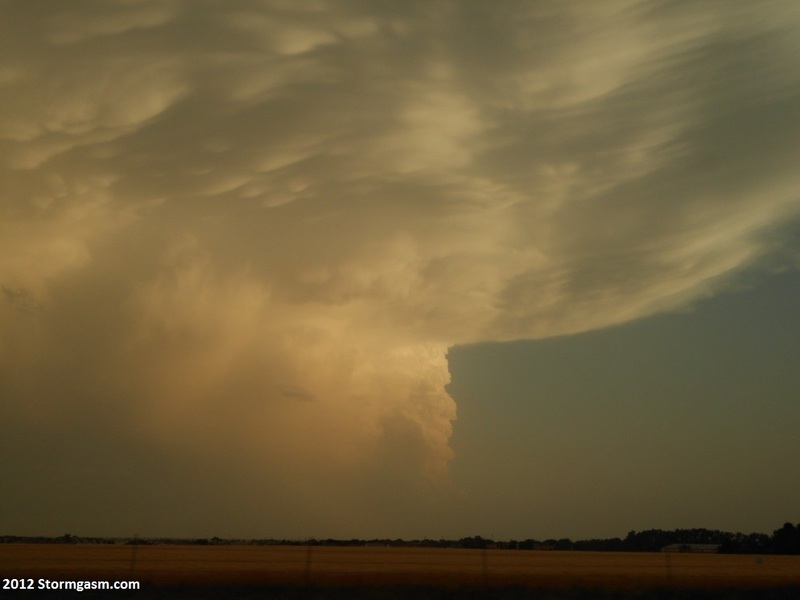 The image above depicts a developing storm and at the time it looked promising. Aw well…things only went downhill from there! 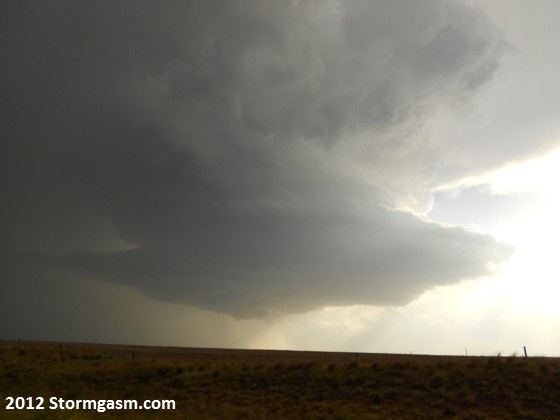 LP supercell with a rain-free base well north of Hays, KS. After a lot of stopping, re-evaluating, looking at radar, heading back south then north again and watching cell after cell strengthen and then weaken, we came upon this lp supercell quite a bit north of Hays. It only had limited time to get its act together because another cell to its south was moving quickly to the north towards this cell. It was only a matter of time before the rain/hail destroyed this nice little cell. Like I said, since the storm motion was mostly northerly, none of these cells had much hope for becoming a nice, tornadic supercell even though the shear was present for that to occur. Eventually, more discrete storms formed off the dryline southwest of Hays and remained discrete. 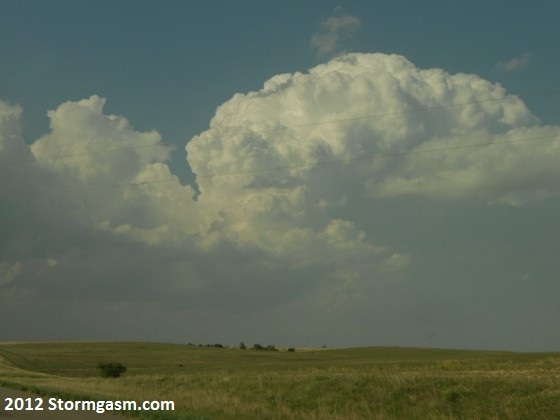 They didn’t look amazing, but anything was better than the convective blob we ended up on still well north of Hays. So we dove south and crossed our fingers, hoping for the best. Jim looking at the map after deciding to drop south for another cell. 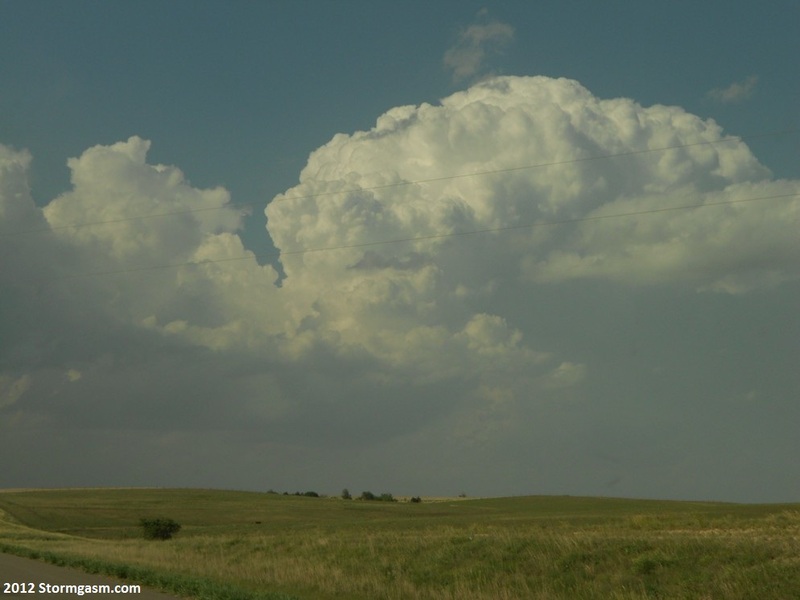 We dropped south and as we were approaching the north side of Hays, we got a couple nice shots of the supercell that was to the south of Hays. As we were driving into Hays the storm began moving in more of a northeasterly direction (finally), and that gave me some hope. This was the first storm of the day in the area to move in such a direction. And it certainly helped make the storm more intense. While it didn’t produce a tornado, the storm produced very large hail near/after dark near Russell, and gave us a spectacular lightning show for the drive back to Wichita. We actually had to take a pretty big detour south and east of Russell to avoid losing the windshield to baseball sized hail after dark. But that detour turned out to be worthwhile since we were in even better view for the lightning show! Intensifying storm south of Hays looking south from the north side of Hays. 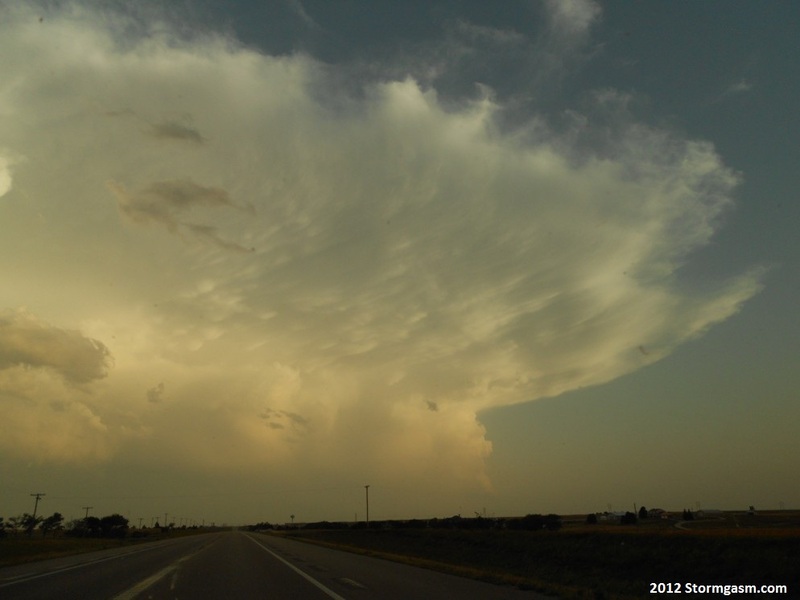 Mammatus clouds seen on the same cell south of Hays. 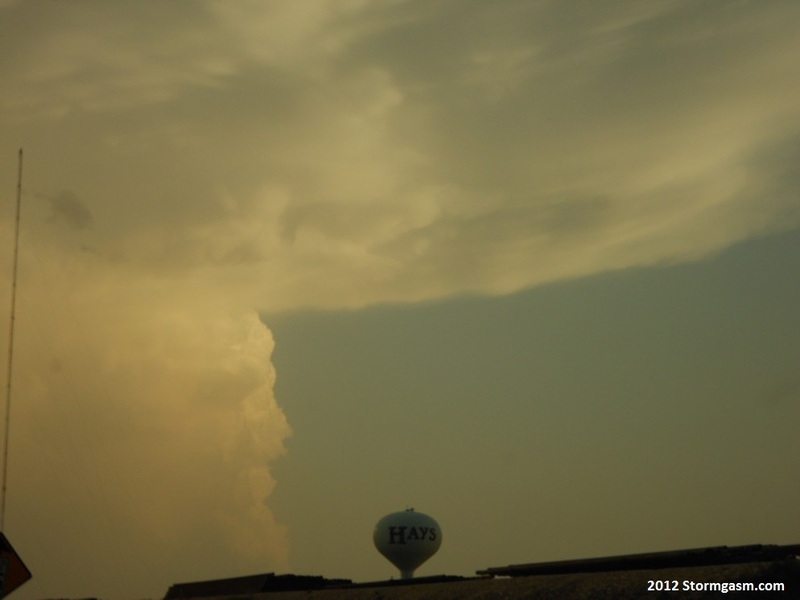 The two images above show the storm to the south of Hays intensifying. 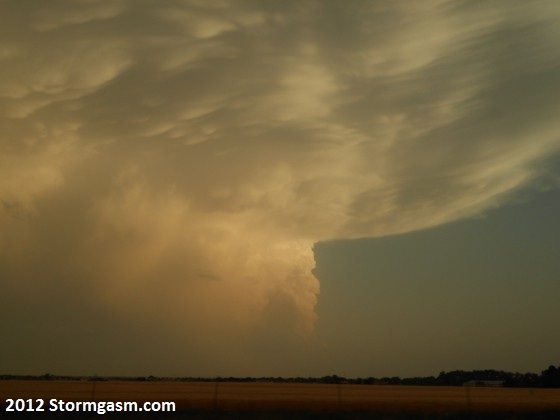 Notice the updraft is completely vertical with no tilt, suggesting explosive intensification. Also note the mammatus on the underside of the anvil. 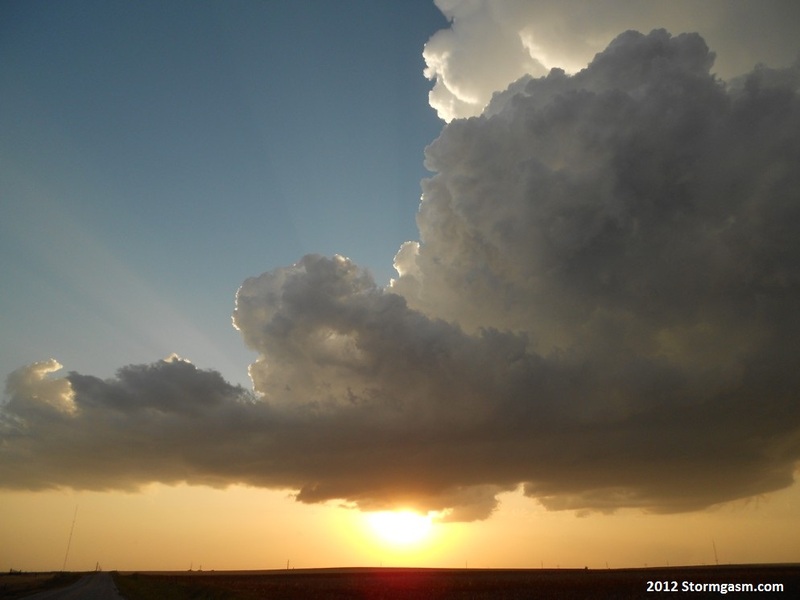 Last shot of the storm north of Hays that we dropped, looking to the north. This trip didn’t deliver everything we had hoped for, but we still had fun. 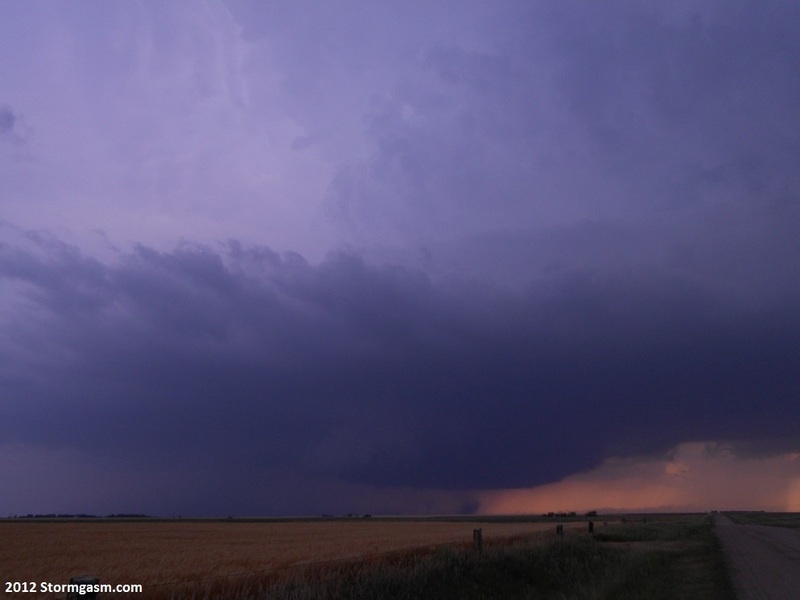 I really think the best day was our first chase day in Nebraska. 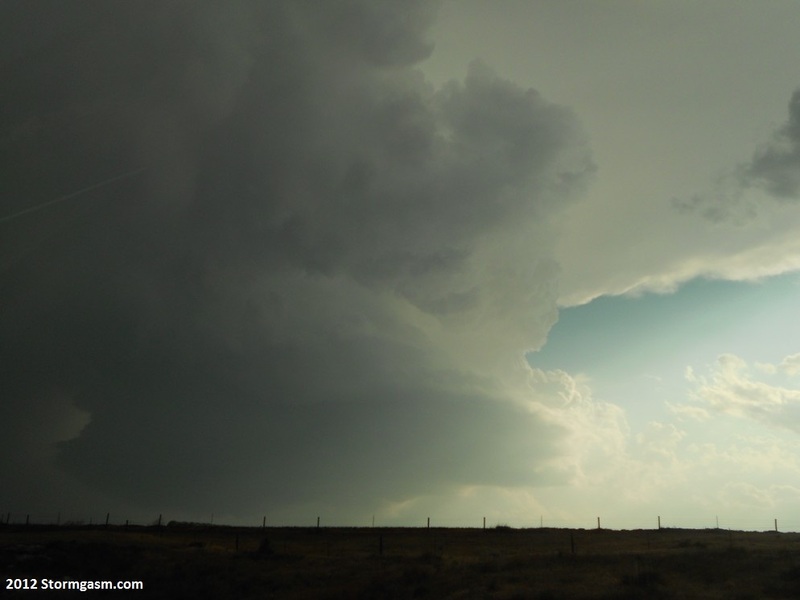 Even though we didn’t see a tornado that day, we chased a cyclic supercell for over an hour producing numerous wall clouds, some funnels and even some brief ‘spin ups’. 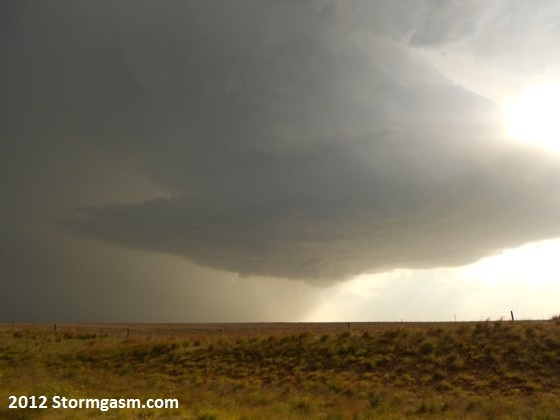 The storm wasn’t moving very quickly and the road network was good, so it make for a really fun chase! Finally, it was great to see our friends in Derby, KS (thank you Mike and Sheila for your wonderful hospitality)! Coming out for a chasing trip just isn’t the same without visiting you guys. I wonder when the next chase will be ? ….